March movies: March should come in like a box office lion and stay that way all month. That winning scenario would follow two months of hot winter ticket sales for films like "American Sniper" ($331.1 million through last weekend), "Fifty Shades of Grey" ($147.8 million), "The SpongeBob Movie: Sponge Out of Water" ($140.3 million) and "Kingsman: The Secret Service" ($85.7 million). Last weekend's $19.1 million launch for Warner Bros. 'R rated crime comedy "Focus" ended February on an up note as we enter March. Here's a quick look at the wide releases to watch for as March marches on. There are double digit overall first choice tracking scores for Columbia Pictures and Media Rights Capital's R rated sci-fi action thriller "Chappie," opening this weekend at about 3,000 theatres. 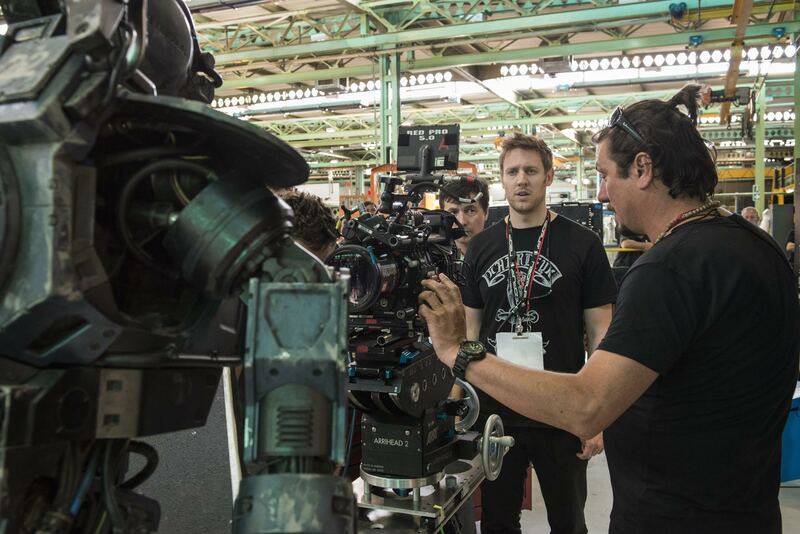 Directed by Neil Blomkamp ("District 9"), "Chappie" stars Hugh Jackman, Sigourney Weaver, Sharito Copley and Dev Patel.It's tracking best with under-25 males and nearly as well with men over 25. Blomkamp's R rated sci-fi action thriller "District 9," which also starred Sharito Copley, opened Aug. 9, 2009 to $37.4 million. It went on to gross $115.6 million in domestic theatres. 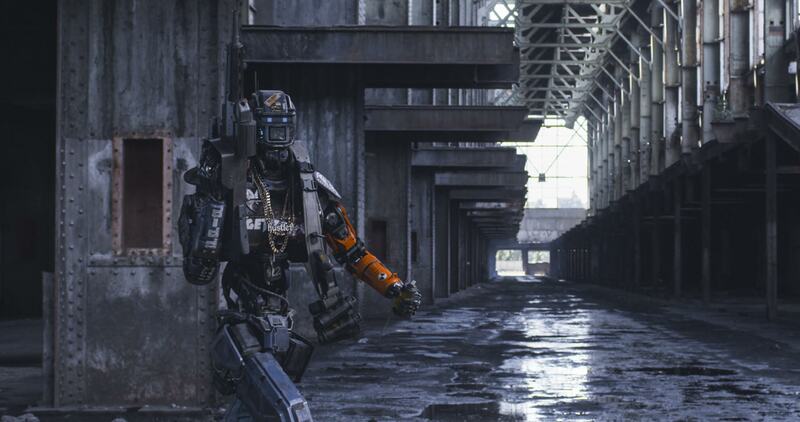 What makes the title character in "Chappie" differentis that he's a robot. Chappie is, in fact, the first robot who's able to think and feel, which is why hecan change how the world regards robots and humans. 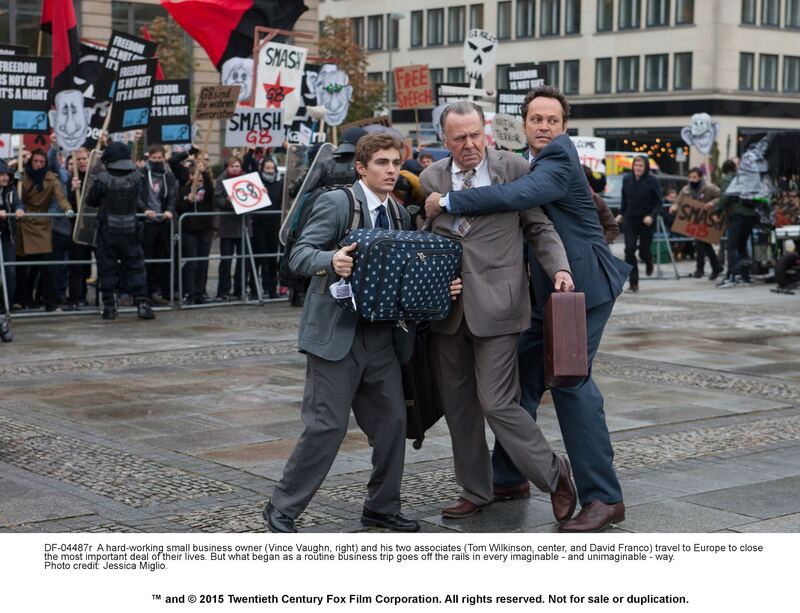 20th Century Fox and New Regency's R rated comedy "Unfinished Business," opening this weekend at about 2,800 theatres, is directed by Ken Scott ("Delivery Man") and stars Vince Vaughn, Dave Franco and Tom Wilkinson. It's tracking best with women over 25 and doing nearly as well with 25-plus males. Vaughn plays a hard-working small business owner who travels to Europe with two associates (Wilkinson and Franco) to close the most important deal of their lives. But what begins as a routine business trip quickly goes off the track in every imaginable way -- and even some unimaginable ways! Fox Searchlight Pictures and Participant Media's PG rated comedy drama"The Second Best Exotic Marigold Hotel" opens this weekend at about 1,400 theatres. Directed by John Madden ("The Best Exotic Marigold Hotel"), it stars Maggie Smith, Richard Gere and Bill Nighy. "Hotel" is tracking best with 25-plus females. The original "Marigold Hotel" opened May 4, 2012 to just $747,051, but went on to gross $46.4 million in domestic theatres. In the sequel, the expansionist dream of Sonny Kapoor (Dev Patel)isclaiming more of his time than he has available given his imminent marriage to Sunaina (Tina Desai). Sonny has his eye on a promising new hotel property now that his first venture, The Best Exotic Marigold Hotel for the Elderly and Beautiful, has only one remaining vacancy. Mar. 13 will see two wide openings targeted to very different audiences.Walt Disney Pictures' PG rated live action family adventure drama "Cinderella" is directed by Kenneth Branagh ("Thor") and stars Lily James, who plays Lady Rose on "Downton Abbey,"as Cinderella, Hayley Atwell as her Mother and Helena Bonham-Carter as her Fairy Godmother. "Cinderella," a legendary family audience brand name, is one of Disney's most treasured titles. The studio's animated classic, whichopened Feb. 15, 1950, was made for about $3 million anddid over $34 million domestically, a sizable gross for its time. "Cinderella" is tracking in double digits as an overall first choice to see. It's doing best – in high double digits – with under-25 females and also tracking well with women over 25. The film follows the fortunes of Ella, whose father remarries following her mother's tragic death. Ella welcomes her new stepmother and her daughters into their family home, but after her father dies unexpectedly, she finds herself at the mercy of a jealous and cruel new family. Ella becomes a servant girl covered in ashes, and spitefully renamed Cinderella. Refusing to give in to despair or to despise those who abuse her, Cinderella meets a dashing stranger in the woods, not realizing that he is really a prince. Warner Bros.' R rated action crime drama "Run All Night,"also arriving Mar. 13, is directed by Jaume Collet- Serra ("Non-Stop") and stars Liam Neesan, Joel Kinnaman, Common and Ed Harris. It's tracking best with 25-plus men and next best with women over 25. In "Run," hit man Jimmy Conlon (Neeson) and mob boss Shawn Maguire (Harris) are friends who become enemies when Conlon kills Maguire's son to save his own. Now they must survive a night on the run by staying ahead of everything Maguire can muster. One of the month's most anticipated releases, Lionsgate and Summit Entertainment's sci-fi action adventure "Insurgent,"opens Mar. 20. Based on Veronica Roth's best-selling "Divergent"young adult book trilogy, it's directed by Robert Schwentke ("RED") and stars Shailene Woodley, Ansel Elgort and Theo James. The franchise's first episode, "Divergent," opened Mar. 21, 2014 to $54.6 million and did $150.9 million domestically. "Insurgent" should track as "Divergent" did, with likely double digit appeal as a first choice film to under-25 females and next best scores with women over 25. In "Insurgent," Tris Prior (Woodley) continues trying to save herself and those she loveswhile plagued with questions of grief and forgiveness, identity and loyalty and politics and love. Meanwhile, war looms and conflict between factions grows. Open Road Films and Silver Pictures' R rated action crime drama "The Gunman" is good male appeal counter-programming for Mar. 20. Directed by Pierre Morel ("Taken"), it stars Sean Penn, Idris Elba and Javier Bardem. Penn plays an international spy who must clear his name in order to save himself from being killed by the organization he used to work for. Rounding out the weekend is Pure Flix Entertainment's PG-13 rated drama "Do You Believe," from first time feature director Jonathan M. Gunn. Starring are: Ted McGinley, Mira Sorvino and Andrea Logan White. "Believe's" faith based Christian target audience has generated sizable boxoffice successes in the past, including "The Passion of the Christ" ($370.8 million in 2004), "Heaven is for Real" ($91.4 million in 2014) and "God's Not Dead" ($60.8 million in 2014). "Believe," from the creators of "God's Not Dead," focuses on a dozen different souls,whose lives unexpectedly intersect while all of them are moving in different directionsand longing for something more from life. The month winds up Mar. 27 with two wide openings. Warner Bros. male appeal R rated comedy "Get Hard" is from first time feature director Etan Cohen and stars Will Ferrel, Kevin Hart and Alison Brie. Ferrell plays millionaire James King, who's convicted of fraud and is prison-bound when he turns to Darnell Lewis (Hart) for advice on how to survive behind bars. Also on tap in late March is DreamWorks Animation and 20th Century Fox's PG rated 3D family appeal animated fantasy adventure "Home,"from the creators of "The Croods" and "How to Train Your Dragon." Directed by Tim Johnson ("Over the Hedge"), it stars the voices of Jim Parsons, Rihanna and Steve Martin. In "Home," alienscalled The Boov take over Earth and all humans are relocated as the planet is reorganized. The resourceful Tip (Rihanna)avoids capture andfinds herself the accidental accomplice of Oh (Parsons), a banished Boov. Together, they embark on the road trip of a lifetime. Bottom line:2015 ticket sales are running nicely ahead of this time last year and that trend should continue as March unfolds. Through last weekend, the year's $1.8 billion gross is up about 8.8 percent from last year, according to the boxoffice data firm Rentrak. With high profile brand name films like "Cinderella" and "Insurgent" on the horizon, the boxoffice should be blossoming as winter's snows finally melt.